We are home from a fun weekend in Waco. We saw lots of great friends and did lots of fun things. I enjoyed some MUCH needed girl time at Ninfa's Friday night, and Gary enjoyed a fun golf outing on Saturday. Shelby and I took our kids to the Mayborn Museum . I have to say it was AMAZING! Here are a few pics from the museum. Ooh, Mexican. I love it. I'm glad you had a great weekend and got to do some fun things. Great job on the collage. Love collages!!! You did wonderful!!! Sounds like a great weekend!!! Great college! Looks like you had a great weekend...how can you not, if a girls' night is involved!? I have no idea how to do a collage! Wouldn't have the first clue!! Your is super cute and sounds like a great weekend! So glad you were able to spend some girl time, good for you! In my opinion, you can never have too much Mexican food! 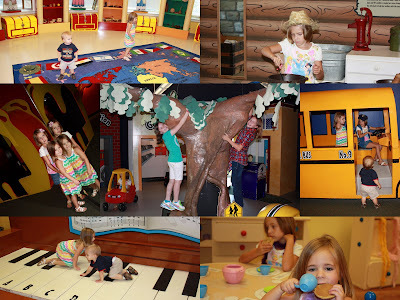 My aunt lives in Waco and we LOVE the Mayborn Museum! Glad you got out with just the girls! It's good for the soul.